Congratulations to the new office bearers and Board members that were elected at the SAIF AGM held on 21 May 2018. Although Ms Kotze has resigned as the Chairperson of SAIF after the AGM, she remains on the Board of SAIF. During a recent post on the SAIF website, Ms Kotze’s name was inadvertently omitted as a SAIF Board member. SAIF wishes to apologise for this oversight and would like to take this opportunity to thank Ms Kotze for her valued contribution to SAIF over the years and look forward to her involvement in the coming years. At the SAIF Board meeting in June 2018, the Board took a decision not to appoint a Vice Chairperson but hold off this appointment to the AGM in May 2019. To rise to the challenge of the global manufacturing marketplace driven by productivity, flexibility and the need to develop workers able to lead in such an environment, SAIF has developed a national coordinated approach to foundry skills development, ensuring sustainability of the existing interventions and enhancing the roll-out of new training courses deemed relevant to the industry. 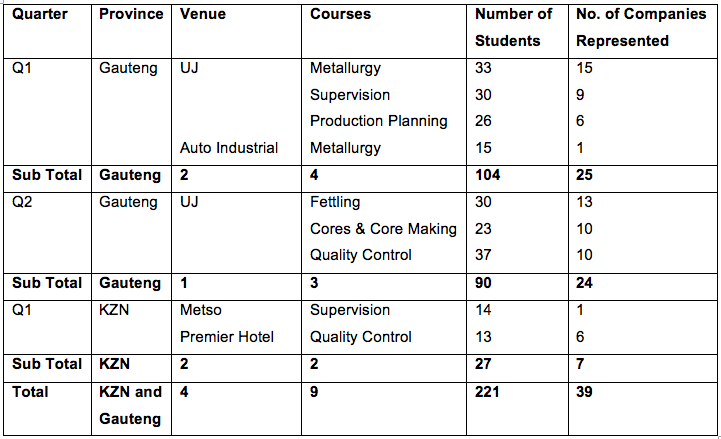 SAIF has been rolling out the well-known 8 Module Industry Skills Programme and on-demand short courses to the wider industry. The training modules are accepted and trusted by industry as evident by the increase in numbers since the start of the training in 2010. 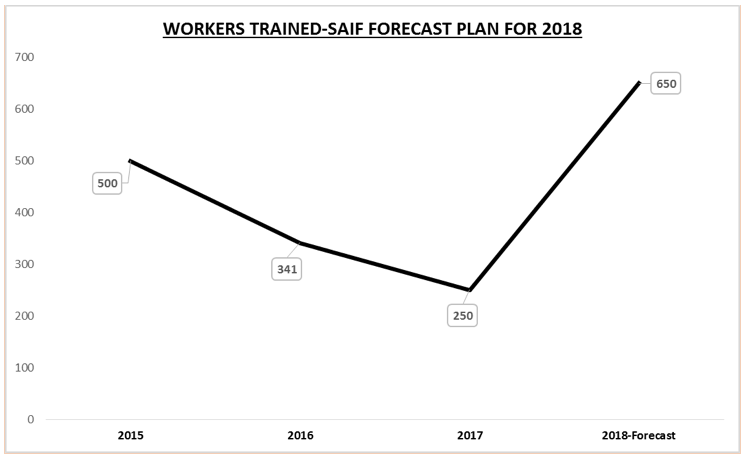 SAIF will accelerate this training programme during 2018 within the provinces of Gauteng, KwaZulu-Natal and the Western Cape. In addition to these class room based lectures, customised courses have been planned to be delivered to specific companies in Gauteng and KZN. 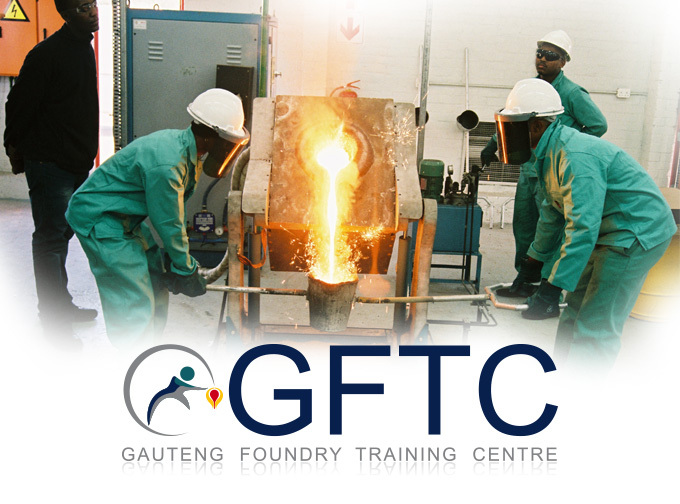 The Gauteng Foundry Training Centre (GFTC) was officially launched on 18 September 2013 at the Ekurhuleni East College in Kwa Thema, Springs. A hub for foundry related skills training and technology transfer, the project was funded by the Gauteng Department of Economic Development (GDED) in partnership with the National Foundry Technology Network (NFTN), an initiative of the Department of Trade and Industry (the dti). The GFTC offers facilities and infrastructure for both theoretical and appropriate practical training, thus contributing to addressing the availability of skills that have been identified as scarce. The GFTC is the only accredited foundry training centre for the artisan qualification in Moulding and Pattern Making and hence is registered with the Quality Council for Trades and Occupations (QCTO) with those credentials. The artisan trade test qualification for the Melter is long outstanding as the process has moved from the legacy type qualifications with merSETA to the new frame of occupational qualifications with QCTO. An audit of the GFTC has been conducted by the National Artisan Moderating Body (NAMB) and the facility itself has been approved for artisan trade testing with respect to the Melter Trade apart from already being qualified to offer the other two trade tests within the disciplines of Moulding and Pattern Making. However, since this is a new qualification, two individuals have been identified to undergo the Melter trade test and then themselves become assessors. Mr Errol Beling and Tom Richards will supply their current portfolio of evidence (POE) against the Artisan Recognition to Prior Learning (ARPL) toolkit that will then allow them access to the Melter trade test at the GFTC. The NFTN together with the dti has finalised their business plan and budget for 2018/2019. The process of awarding industry wide projects will be finalised shortly and will be shared with SAIF. A project on spent foundry sand has been presented to the Innovation Hub by the City of Ekurhuleni and UJ’s Department of Town Planning in order to manufacture bricks from waste foundry sand. The funding of this project will be shared by Process Energy & Environmental Technology Station (PEETS) and The Innovation Hub. The details of the funding model is being addressed with PEETS, UJ and The Innovation Hub, after which a formal MOU will be drawn before the project is officially launched. SAIF and Concepts 4.0 approached DEA with a proposal for a relaxation of the current AEL legislation with respect to foundries. This project is being funded 90% by PEETS and 10% by SAIF. The SAIF portion of the funding was sponsored by ABP. After the second meeting with DEA this year, the terms of reference has been edited by DEA and the project has officially been launched. The report together with its recommendations will be presented to DEA by SAIF at the end of October 2018. 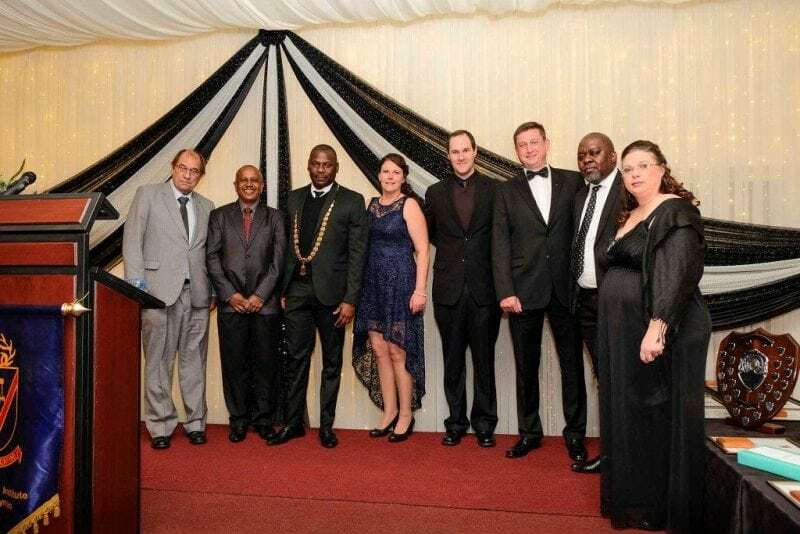 SAIF hosted its 54th Annual Awards Dinner on the 1 June 2018 at Summer Place in Boksburg. The dinner was attended by 180 guests who enjoyed the evening with members of the Board, management committees, sponsors and award recipients. For the best technical paper presented during 2017 by a Non-Member to the Institute. Total Foundry Control Using Synchro ERP Software Integration awarded to Mr Jean Marie Darchicourt and Mr Max Morgan from Synchro ERP. For the best technical presentation presented during 2017 by a SAIF Member. Accessing New Markets for High Pressure Die Casting Foundries Through fully Comprehensive and Autonomous Process Optimisation awarded to Mr Andrew McFarlane from Ametex Pty Ltd.
For the highest marks achieved by a 1st Year Metallurgy Student for 2017 awarded to Mr Moeketsi Lekhula from the Vaal University of Technology. For the highest marks achieved by a final year Metallurgy Student for 2017 awarded to Ms Khutsiso Chiloane from the University of Johannesburg. On behalf of SAIF, thank you to each individual for their dedication to complete the course and a special thanks to every company who invested in the development of their workers. SAIF would like to thank the following sponsors and individuals for their contributions. A review of the 2018 Awards Dinner is being managed by the office. A questionnaire will be sent to the membership and the responses collated to establish the satisfaction of the members with respect to the event that was held at a new venue, viz, Summer Place. The responses will be tallied and shared with the membership together with proposals in a bid to improve the presentation of this prestigious event in 2019. The SAIF Annual Golf Day has always provided our members with an excellent networking opportunity. The annual Golf Day will be held on 15 November 2018 at the Reading Country Club. Please contact the office for more information or to become a sponsor. Detailed information will be distributed shortly. SAIF has made an application for a National Pavilion to be sponsored by the dti on behalf of its members. Once the application is approved by the dti for sponsorship, SAIF will invite submissions from its membership for potential exhibits at this event. GIFA will be held in Dusseldorf, Germany from 25 – 29 June 2019.